The Arrow Cross was the symbol of the fascist Arrow Cross Party (Nyilaskeresztes Párt) who came to power in (then German occupied) Hungary on October 15 1944 after Admiral Horthy tried to negotiate with the allies. Acording to Symbols.com, the Arrow cross has been used by Magyarian tribes about the time that they arrived in the region now called Hungary, around the year 1000 A.D. The most well known version of the flag was identical to the hakenkreuzfahne apart from the symbol in the center of the flag. 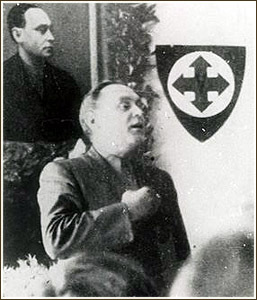 The "H" on the Hungarian Nazi (Arrow Cross) movement’s flag stands neither for "Hungaria" nor for "Horthy" (Horthy was an enemy of the Arrow Cross movement). It stands for "hungarizmus" (hungarism), the name of the ideology of the Arrow Cross movement. According to Forgotten Legions of the Third Reich [ltj85] by David Littlejohn, the "H "was added to Arrow Cross symbol «when the Arrow Cross became the Hungaria Movement in 1944», thus "H" being for "Hungaria". This, disc with a black, "H"-less cross, is the flag of the Hungarian version of the Nazi party and was used in the time that Szálasi was in power (1943?-1945). The arrow cross in green, charged with a white capital "H", on a white disc on a red background, as shown on a photo on the book A magyarok krónikája (The Hungarians’ Chronicle), by Glatz Ferenc (Mohndruck GmbH: Gütersloh, 1996: 628). The same emblem as the badge, together with the same-designed armband and a party membership booklet, which also has the emblem printed in it, was offered for the auction at this website. Photo of a party poster from 1941, showing the same flag, can be seen here. The center of the cross is hidden behind the flag-bearer's head, so it is not actually clear if the letter "H" was meant to be there or not. However, the above sources prove that the design variant without the letter was widely used and that the letter, if its use was mandatory, would certainly have been shown there, so it must have been the same in case of this poster. The fact that the cross clearly does not appear as black, but dark gray, is the evidence that its real color was green. The same photo, in a larger format, was published in Serbian weekly magazine NIN (ISSN 0027-6685), issue 3160 of 2011-07-21, p. 10, as the illustration of an article about the controversial verdict in the case of Sándor Képíró, who was tried for the WW2 war crimes committed in Novi Sad, Serbia, and found not guilty. This photo (sources: AP and Hungarian National Museum), besides an even better view of the black and white appearance of the flag colors, also clearly showed the finials of these flag: an arrow cross within a ring, on which is resting an eagle affronty, wings displayed and elevated. This was probably the official finial for the party flags. The arrow cross in green, charged with a white capital "H", placed on a 90 deg. lozange, on the red hoist half of a flag with the fly hoist with nine stripes alternating red and white. This is shown flying in a hungarian war propaganda poster (along with the hungarian tricolor and the contemporary german flag) reproduced on the book A magyarok krónikája (The Hungarians’ Chronicle), by Glatz Ferenc (Mohndruck GmbH: Gütersloh, 1996: 628). This does look like an old flag, with colors partly faded. The interesting details are that the cross with the letter "H" is actually rotated for 90 degrees, as if the flag was meant to be hung vertically, and that the fly part is much larger than the hoist part (the flag is shown as such in the attached image). I try to get some information about this: I found nothing! No picture, no poster, no text. It seems this flag never used.